Back in 1975, filmmaker Tom Schiller (only 20 years old at the time) made a short documentary on the novelist Henry Miller (Tropic of Cancer, Tropic of Capricorn). In the scene above, Miller, then 81 years old, reminisces about his difficult early life in New York, and it all takes place on the set used to shoot the movie Hello, Dolly!. Schiller's complete film, Henry Miller Asleep and Awake, can be watched for free on Snagfilms. (It's also available at Amazon on DVD here.) The run time is 34 minutes. Excellent find by Mike. The reader is a friend, not an adversary, not a spectator. Fiction that isn't an author's personal adventure into the frightening or the unknown isn't worth writing for anything but money. Never use the word "then" as a conjunction – we have "and" for this purpose. Substituting "then" is the lazy or tone-deaf writer's non-solution to the problem of too many "ands" on the page. Write in the third person unless a really distinctive first-person voice ­offers itself irresistibly. When information becomes free and universally accessible, voluminous research for a novel is devalued along with it. The most purely autobiographical fiction requires pure invention. Nobody ever wrote a more auto biographical story than "The Meta­morphosis". It's doubtful that anyone with an internet connection at his workplace is writing good fiction. Interesting verbs are seldom very interesting. You have to love before you can be relentless. Get more details from Flumotion here. PS On a related note, TEDxNYED will stream talks live on March 6th. Speakers will include Lawrence Lessig, Henry Jenkins, Jeff Jarvis, Michael Wesch and others. Looks like a great event. Get more details here. The BBC brings you Folk America, a three-part documentary series on American folk music, "tracing its history from the recording boom of the 1920s to the folk revival of the 1960s." We feature above the third segment, Blowin' in the Wind, which takes you straight to the 1960s, when Bob Dylan and Joan Baez hit the stage. The other two segments that make up Folk America include Birth of a Nation and This Land is Your Land. Perhaps you're already familiar with Librivox. If not, you should be. 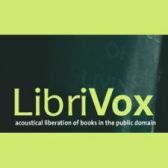 Librivox provides over 3000 free audio books. The books (all in the public domain) are recorded by a passionate community of volunteers, and they're all made freely available to you. (See their catalogue here.) Millions of people have downloaded their books. And, as you can imagine, the web hosting costs can run quite high. For the first time in 4+ years, Librivox is looking to raise some money. Please consider making a donation, however small or large, and support this very worthwhile project. You can find more information and donate here. The Deepest Part of the Ocean – To Scale!